My parents wanted my safety “waiter job” to be a doctor. 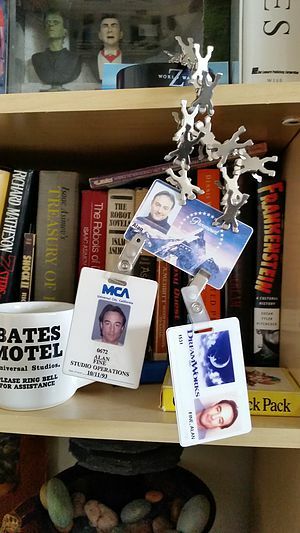 I was pre-Med at Tufts University, but bought my biology text books backstage when performing standup at the Comedy Connection in Boston, much like Tom Hanks in the movie “Punchline.” By senior year, I was performing regularly, so I decided to move to LA to work the Improv, Comedy Store and write screenplays. My first truly safe “waiter’s job” was selling computers at “Programs Unlimited” in Studio City. I had bought a Kaypro 2X, billed as the “Writer’s Computer” and I loved writing scripts with it. So I learned everything I could and returned to the store for what turned out to be a career. Hollywood writers would buy computers from me, get frustrated and ask me to help them. Assisting took up too much of my time, so I asked to be paid. Over the years, without technical schooling or obtaining professional certifications, I became a Senior Technical Analyst for DreamWorks and Paramount Pictures, with non-disclosures so I could specialize in supporting the top executives in both companies as my clients. I’ve been in the NY homes of Steven Spielberg and David Geffen, and was asked to personally assist with high profile presentations for Jeffrey Katzenberg and Paramount CFO Frederick Huntsberry, who requested me to run his private presentation with Martin Scorsese at the Directors Guild. As tantalizing as my “waiter’s job” was, I never exploited it for my own advantage, making sure I always had the fallback job my parents trained me to keep. Shmucky, huh? But it was hard to walk away from the money and amazing backdoor access to Hollywood. 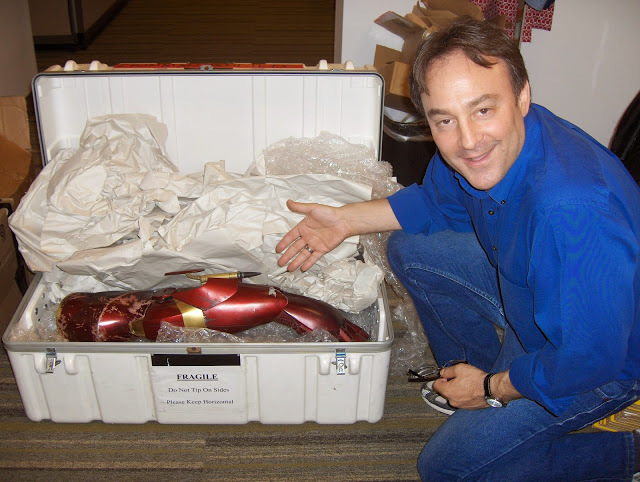 Alan Fine with a part of the actual Ironman costume worn by Robert Downey Jr. at Paramount Pictures. Or like when I was working for Pop.com, Ron Howard, Steven Spielberg and Brian Grazer’s internet company, and they met with Microsoft’s Paul Allen for another round of funding. Behind closed doors, the presentation failed and I was summoned. The CEO was ashen as I was shoved into the room by the CFO. I remember all the famous faces watching me as I dived under the table to look for the problem. That’s when — to show a different film — they turned off all the lights. I was forced to solve the problem by Braille in the dark. The next day the head of HR called me in her office. The company was indebted and wanted to repay me for saving the day. Unfortunately at the time, I was a consultant, and to give me a bonus or even a dinner would have crossed some line between consultant and employee, somehow empowering me if I chose to force the company to give me benefits or something. I received a handshake instead. Ironically, I think I received more value from the retelling of that story than I ever could have from an actual bonus. But here is a story that puts into perspective just how close — and yet how far — I was from the real action. When Steven Spielberg finally won his first Oscars and he arrived at work the next morning, there was a big loud cheer at Amblin, his lot within the Universal City lot. And I was RIGHT THERE, WITH HIM and his staff, crying with happiness, until I realized in order to participate in this amazing event, I was actually hanging off a rain gutter on the side of a bungalow just BEYOND the Amblin fence, because I was working for different producer at Universal then. So the time has come to lay to rest my computer geek alter ego, except that I have him on retainer for www.catalystghoststories.com, and to troubleshoot my film production computers and software. At the end of the year, when the restaurant manager asked me how much I was making in tips for tax purposes, I’d hidden the twenty dollar bills left in my jar, I answered incredulously, “Tips?! Hell, I’m just a bathroom attendant.” Although, some nights I played piano there and will never forget the thrill of entertaining Walter Matthau, Jack Lemon and their wives, who asked me which Gilbert and Sullivan song I was playing, and I was able to say that it was actually a parody of that duo’s work I composed and thanked them for noticing. But all that is behind me now that I have declared to the world my original goal. Hopefully my stories will remain interesting. I love shows about filmmaking, like “Project Greenlight” and “The Chair.” The blog posts I will leave at this website will be my version of that. If you are curious about what it takes to get a feature film off the ground, I invite you to please keep checking back. I look forward to sharing these stories with anyone interested.